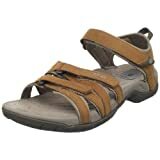 This best selling sandal, is smart enough to wear with a dress and practical enough to give all day comfort. It has a soft leather upper with a hook and loop instep closure for easy entry and a secure fit. It also features a moisture wicking microfibre topsole with antibacterial treatment to inhibit odour, and a ‘Shoc Pad’TM in the heel for comfort, stability and impact absorption. The rugged all-rubber outsole provides a firm grip on any surface.